I know we’ve only just sorted out our Instagram account but this week we’re talking about a new way to share, Periscope. In case you aren’t clued up on the latest social media trends, Periscope is a platform that enables users to broadcast videos in real time. All the cool kids are using it. Pioneering the way, they’re slowly but surely working out what it does and why exactly that’s good. In its first 10 days post-launch it hit 1 million users and within 2 months 10 years worth of video was being watched on the platform per day. The useful part is that it’s now also becoming increasingly effective in a professional capacity as an innovative industry resource. Periscope allows you to give viewers a little (carefully curated) peek ‘behind the scenes’. You can add that personal touch while still controlling what they see, making it seem like they’re getting exclusive access. Like a little virtual fly on the wall. If you can get past the slightly creepy aspect it can work in your favour and be a great marketing tool. 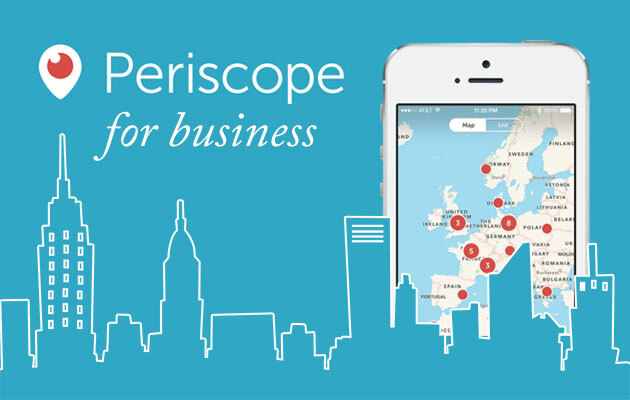 One way that you can use Periscope to benefit your business is to show live product demos. Use the stream to showcase the snazzy features of your product, give a brief tutorial and create a buzz about what you’ve got to offer. Be as creative as you like. You can then use this technique to answer questions in real time and successfully engage with your customers, with the added benefit of solving any issues straight away. Periscope can also be useful for sharing relevant industry news as it happens. It’s 2015 and we need our information fast. Periscope is instantaneous so you can be the one to break the story to your online community while everybody else is still just gathering content for a good old fashioned blog post. (Not that we don’t love a blog post!). With a live stream you’ll be way ahead of anyone going through the process of drafting, typing, proof-reading and posting an article. Once you’ve ended your broadcast you can use the clip to populate your other social media channels. Turning on Autosave Broadcasts enables you to use your video afterwards, to post wherever you fancy and extend your reach a little further. This might then work to pull a bigger audience next time you stream. You can choose to turn on twitter sharing so that all of your twitter followers know when you’re live too. It’s also another way to connect with industry influencers, which can’t hurt, right? The purpose of Periscope was, at it’s most basic level, to connect people. The creators “wanted to build the closest thing to teleportation.” and open up these little windows into other day-to-day lives anywhere on the planet but you can go one step further and use it to connect with useful people. Rather than merely opening the app and joining a girl in Brisbane walking her dog, you can find influential people and ‘teleport’ right into their lives. This can help you get noticed in your industry if you’re smart about it. Make insightful comments, ask relevant and intelligent questions. Plus, if they’re saying something valid you might actually learn something. Businesses will generally broadcast on a regular basis so make sure to tune in on the right day. Simply showing up every time can be enough to make a good impression. Likewise you’ll want to make sure that you are posting your content on a regular basis too, if you can. A consistent schedule means your viewers will know where to find you and when to tune in. This will maximise your reach and you’ll be ahead of the live-streaming game before the Australian girl and her dog are even back from their walk. If you’ve not yet jumped aboard the bandwagon you can download Periscope here.